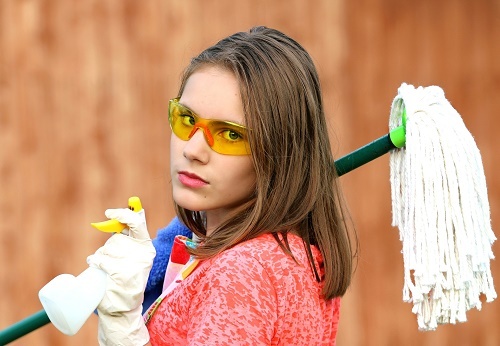 7 Top Tips to Spring Clean Your Business! Well spring has officially started and what better way than to take some time out to implement these Top Tips smarten up your business and get everything shipshape for the year ahead. Are your records up to date? Are you sending out invoices on time and checking if they are paid? Do you have any consistently late payers? I find a simple Invoice Control spreadsheet helps me see at a glance what’s outstanding and how long people take to pay. If your cash flow is suffering could you amend your payment schedules and terms and conditions to insist on larger deposits or shorten your payment terms? Would it help to have some accounting software or an App? This could save you time and stress for example by recording your mileage and keeping your personal and business expenses separate. Are you spending too much time in your business and not enough time on your business? If your business is evolving, do may you need to revise your goals. Sometimes you just need to take a step back and think about where to spend your time so that it will add the most value to the business. Working ‘on’ your business includes looking at how you can innovate and adapt your business to grow your income. Looking at how you can motivate or develop yourself or your staff can also take you in new directions. Whilst taking some time to investigate new technologies and processes can make you more productive and streamlined. Social media can also be another time absorber – try to limit it to set times, twice a day and take advantage of those social media scheduling tools. Don’t forget you can update, amend and re-use your content to save time. No one is good at everything, if you are spending too much time and stressing doing your accounting, social media or marketing, then it is probably worth your while bringing in reinforcements. There are lots of small businesses and Virtual Assistants out there who will relieve you of the things you hate to do and not tie you into long or expensive contracts. Find someone you like at a networking event, check your LinkedIn connections or just ask a trusted friend in business. What about outsourcing some of your home chores? Employing a cleaner or gardener not only frees up more time but saves all those arguments at home about who does what! You can then spend your time more profitably building your business and keeping your clients happy. Are you happy with your customer base? Are there clients you dread meeting, who are awkward, downright difficult or don’t pay on time? Have a think about what makes you happy in your business – nice clients, interesting jobs, being paid and appreciated. Take the plunge and ditch clients who drain your energy by making yourself ‘unavailable’ or increasing your prices to really make it worth your while. Retaining existing clients is so important and is of course easier than constantly making new sales. So think (in a nice way) how you can you get more business from existing clients by ‘upselling’ your services or getting recommendations and referrals from them. Listen to what clients are saying. Where is their pain? Is there something you could develop to offer them, or could you collaborate with an associate to provide a solution? Either way any time invested could develop a service that could be rolled out to other clients. Spring is a good time to update your website, LinkedIn profile and social media bios. There are bound to have been changes to your offer or new testimonials to add. Can you rewrite your About page or profiles to include more key words and make it more focussed? Take some time to check all those outbound links and links from your Contact Form or Download page and fix any broken links before your customer finds them! How many emails do you have in your Inbox? Can you find that email with a vital bit of information or one you sent a customer 3 months ago? Take a morning and really go through your emails, create new folders, organise your sent mails month by month. Delete your Deleted Mail, if not you may find your system suffers from a lack of storage. Make sure you can sort by person and date and even size so you can save those pictures or videos onto your hard drive deleting the emails to free up space. Once your Inbox is more manageable you will find that you feel calmer and more productive. Finally Feng Shui your Workspace! Update or create your Vision Board with hand written aspirations, financial targets, inspirational quotes, motivational images and dream purchases. We all know positive thinking can affect our behaviour – if your targets and dreams are in front of you every day you will find yourself moving towards your goals. Your mind will open up to possibilities and you are more likely to stay on the path to success. Visualisation is not mumbo jumbo, world class athletes use it as tool all the time. Now get yourself a plant, turn on that calming music and get the anti-bac wipes out and have a really go at your phone and keyboard! All good tips, Kim. I enjoyed reading them. Worked on my LinkedIn profile, yesterday, and tackling Pinterest, today. Updating offers on my website, and getting back into blogging.